Patric Chocolate is a range of delicious gourmet chocolates, made either with organically grown cocoa exclusively from Madagascar or blended with equally high quality cocoa from Venezuela. The Patric brand was created in 2006 by Alan Patrick McClure, reflecting his middle name minus the “k”. After having travelled extensively in search for the finest quality cacao source, he launched his first Patric bar in 2007: A dark chocolate bar with 70% cocoa from a single-estate cacao farm in the Sambirano Valley in northern Madagascar. The Patric Madagascar collection includes a 75% bar, also made from Sambirano cocoa, sometimes referred to as the “espresso of Madagascar chocolates”. While Patric's chocolates generally do not contain flavourings, or even added cocoa butter unless absolutely necessary, another 67% Madagascar cocoa bar by Patric includes cocoa butter for texture. The cocoa butter used comes from the same beans and the final taste is closely representative of the source and region, much like a quality wine. Like coffee beans and grapes, cacao absorbs the properties of the soil where it is grown. Flavour profiles of cacao beans from Madagascar have notes of citrus fruit and red berries. Part of Patric's Madagascar collection is a 70% bar branded "In-NIB-itable Bar". The bar which has expertly roasted cocoa nibs on one side won the 2011 Good Food Award for chocolate, a competition based on blind tasting sessions with 115 chocolate entries. Alan “Patric” McClure is considered one of a few pioneering American bean-to-bar chocolate makers. 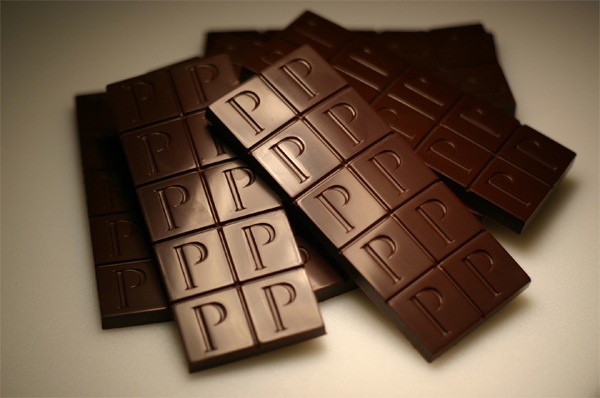 In 2010 his brand was awarded the Best New American Chocolate by Food & Wine magazine. Alan McClure is one of the founding members and current Chairman of the Craft Chocolate Makers of America - an organisation created in 2008 by five leading North American bean-to-bar chocolate makers, dedicated to the idea of producing premium quality chocolate as well as applying honest product labelling, marketing and trade practises. Best New American Chocolate Food & Wine magazine. This page was last modified on 18 March 2018, at 15:47.